A grossing station Patho Gross is a system designed to limit the exposure an operator to chemicals and fumes and to protect from biological risks during surgical specimen manipulation. During pathological and histological dissection, workstation safely contains the vapours emanated from surgical specimens fixed in formalin. With reference to UNI EN 14175 standard, work surface is delimited from three sides on the board containing liquids and closed by an automatic vertical sliding sash equipped with a safety brake. In the central part are mounted interchangeable grid plates with a perimeter sink beneath for the collection of liquids and small organic wastes; automatic washing system due to flushing manifolds allows cleaning of the relative collecting tank. On side parts are mounted: sink with a water spout and mixer tap; sink for formalin discharge, with a tap operated by a pedal control. Extractable multijet shower for cleaning the entire work area; a garbage disposal unit for hazardous wastes. Air purification is guaranteed by two granular activated carbon filters highly effective in removal efficiencies of formaldehyde and two additional pre-filters in synthetic fiber which separate larger particles. For more efficient operation air is drawn in from the front side and top part of the hood, increasing exhausting flow when the front sash is raised, at the same way ensuring higher operator safety. 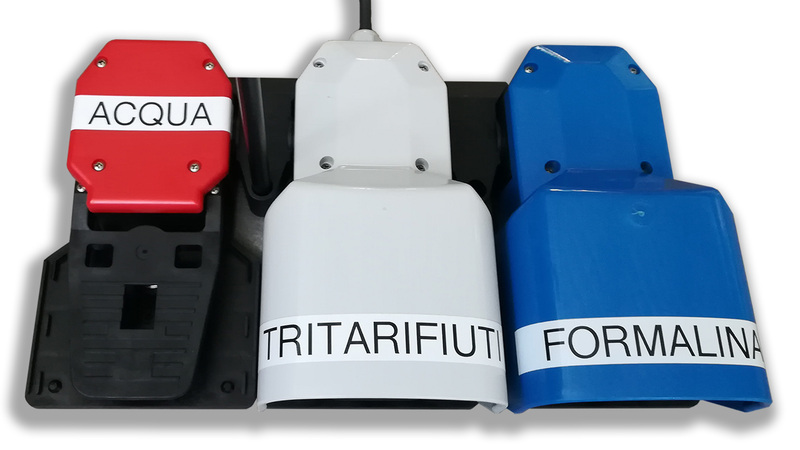 Filter condition is evaluated by electronic control unit which carries the information about operating time and information from sensor which determines the clogging of the filters. 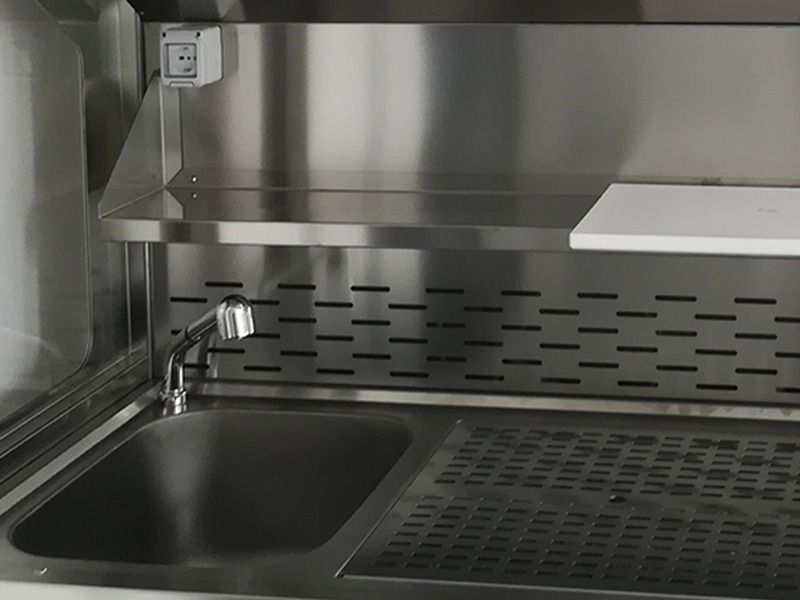 The drainage of the formalin sink is connected to a waste tank located in the compartment under the worktop. 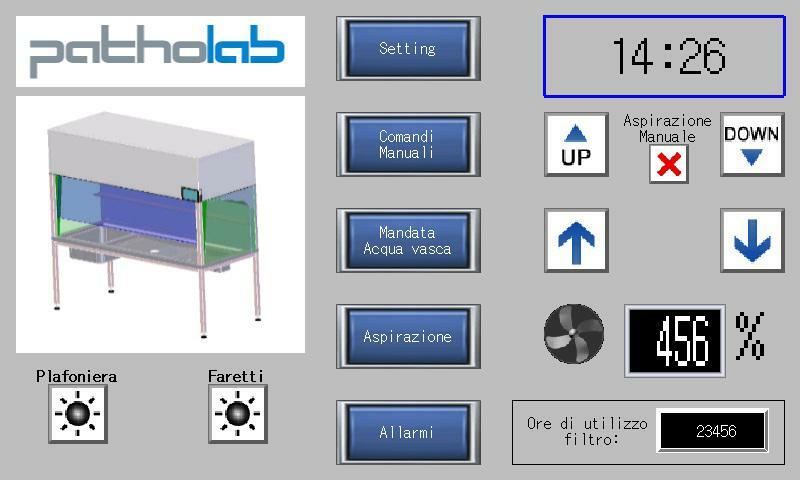 For higher operator safety during the management of dispensing and discharge of formalin the discharge compartment is aspirated and filtered. The formalin waste tank is equipped with a level sensor and an overflow alarm. Copyright © 2018 Patholab Srl. All rights reserved.